The investigation of the Boy in the Box mystery is still being actively pursued by the Philadelphia police department, and by a team of experts at the Vidocq Society, a world-renowned organization that specializes in "cold cases", particularly unsolved homicides. The relative infrequency of the entries on this page should not be interpreted as an indication that the investigation is proceeding at a leisurely pace. Quite the contrary is true! On a daily basis, the investigators are aggressively pursuing a wide range of initiatives on several fronts. Understandably, due to the sensitive nature of their work, the investigators are extremely cautious about revealing anything to outsiders. In fact, as a general rule, this strict security policy applies internally as well. Information about the current status of the Boy in the Box investigation is provided only to those law enforcement personnel who have a legitimate "need to know". However, on rare occasions, the investigators do grant permission to announce certain new developments that they consider reasonably "safe" to reveal to the general public. Whenever that occurs, and if specifically authorized by the Philadelphia police department and the Vidocq Society, we will make those new case developments known. As a sign of my concern for their spiritual welfare and with confidence in God's special care for "America's Unknown Child", I willingly impart my Apostolic Blessing. Recently, Detective Tom Augustine received info that there was a picture of a young Hungarian refugee that appeared in a 1956 newspaper. Tom was able to get a copy of the original and blow up the picture enough to clearly read the boy's nametag. Let me say the boy was a "dead" ringer of our lad - definitely no pun intended. However, when some Vidocq members familiar with facial identification compared the pictures there seemed to be discrepancies. As it stands now, he doesn't appear to be our lad. Keep the faith and never give up. May 1999: An anonymous caller informed the Philadelphia police department about a woman who had lived only a few miles from the crime scene in early 1957. Allegedly, the woman had a little boy who was "about the same age" as the unknown Boy in the Box. According to the anonymous caller, shortly before the unknown boy's body was discovered, both the woman and her son mysteriously disappeared! The caller identified the missing woman by name, and said that she was "almost certain" that the woman had been the mother of the unknown boy. Detective Tom Augustine followed up on the anonymous tip, but he soon discovered that this information was not new. The story about the missing woman and her young son had originally been reported to the local police in 1957. They had checked out the story, and verified that the woman and her son had merely moved away. There was no connection between them and the Boy in the Box case. Augustine also discovered that the "missing" woman's son had subsequently died of injuries that he received in an automobile accident at the age of 21. November 1999: According to Sam Weinstein, head of the Vidocq Society's Boy in the Box investigation team, researchers have thus far been unable to glean a satisfactory DNA profile from the boy's badly degraded remains. The body had been buried for more than 41 years in a crude pine box in damp, loamy soil. Weinstein characterized the boy's remains as "a bag of bones." Nevertheless, he indicated that the effort to obtain a usable DNA profile has not been abandoned. In fact, the investigators still have one more trick up their sleeves. Archaeologists have been able to obtain very usable DNA samples by drilling into the teeth they've extracted from bodies in ancient Egyptian graves (not well preserved mummies necessarily). Because the cores of such teeth are well protected by a surrounding sheath of enamel, the DNA in them has survived for thousands of years. With these DNA samples, scientists are establishing family lines. The Philadelphia Police Department crime lab has one of the unknown boy's teeth in its possession, and they intend to analyze the material in its core. December 1999: A Bucks County, PA man contacted the America's Unknown Child web site and the Vidocq Society. He declared that his family might be able to shed some light on the Boy in the Box case. The man said that he had been born and raised in Philadelphia. He recalled that his parents briefly rented a house in the Oxford Circle section of the city to an out-of-town family in 1956/57. Throughout their nine-month residency, the tenant family remained very secretive and aloof, and little was known about them. Allegedly, most of the neighbors didn't even know how many people actually lived in the house! At about the time the unknown boy's body was discovered, the tenant family moved away quite suddenly, perhaps in the middle of the night. The family departed in such a hurry that they left breakfast dishes and food on the kitchen table! Judging by some articles of clothing and other personal items that were left behind, it was evident that a young boy had lived in the house. The man's mother allegedly reported this incident to the Philadelphia police in March, 1957 but never received any feedback. In late December, the man and his sister personally met with Sam Weinstein and Bill Kelly of the Vidocq Society and discussed the details of this intriguing story. Investigators are currently exploring the new lead to determine whether or not it has any merit. February 2000: The crime lab was unsuccessful in its attempt to obtain a valid DNA sample from the core of one of the unknown boy's teeth. The investigators may send the tooth to an independent state-of-the-art DNA testing laboratory for further study, including mitochondrial DNA analysis. Mitochondrial DNA exists in a little organelle outside the nucleus of a cell. The likelihood of recovering mitochondrial DNA in small or degraded biological samples is far greater than for nuclear DNA because mitochondrial DNA molecules are present in hundreds to thousands of copies per cell compared to the nuclear complement of just two copies per cell. Therefore, muscle, bone, teeth, hair, skin, blood and other body fluids, even if degraded by environmental insult or time, may provide enough material for mitochondrial DNA typing. 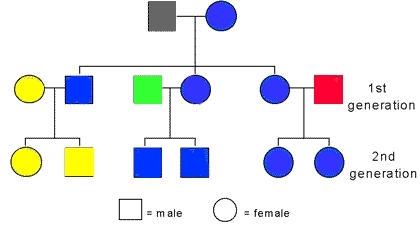 In addition, mitochondrial DNA is inherited from the mother only, so that in situations where an individual is deceased or otherwise not available for a direct comparison with a biological sample, any maternally related individual may provide a reference sample (see diagram, below). In this diagram, females are represented by circles and males by squares. All individuals shown in blue should have identical mitochondrial DNA sequences because they share the same maternal lineage. Thus, all three first-generation children have the same mtDNA sequences, which they inherited from their mother, but in the succeeding generation, only the children of the first-generation females share the same mtDNA sequences. The children of the first-generation male received their mitochondrial DNA from a different maternal lineage. Sam Weinstein, V.S.M. resigned his position as head of the Vidocq Society's Boy in the Box investigation due to medical reasons. The project will now be jointly directed by William H. Kelly, V.S.M. and Joseph McGillen, V.S.M. Both of these men have long and distinguished careers in law enforcement. Mr. McGillen is a former investigator with the Philadelphia Medical Examiner's office, and Mr. Kelly was a police Identification expert. William Kelly participated in the original investigation of the Boy in the Box case in 1957. August 2000: While searching through the original case files, Vidocq Society investigators, Bill Kelly and Joseph McGillen, discovered an index card confirming that in March, 1957 the lead about the hasty overnight departure of a mysterious tenant family in the Oxford Circle area had been provided to the Philadelphia police. The card also bore the name of a female neighbor whom police had interviewed after getting that tip. The neighbor had babysat for the tenant family during the short time they lived in the neighborhood. She testified that there was a young boy in that family, but he was only 2-1/2 years old at the time (rather than the unknown boy's estimated age of 4 or 5), and that he bore no resemblance to the unknown boy in the box. There was a reference number on the index card to a page number in one of the master books containing the actual interview with the neighbor, but the Vidocq investigators were unable to locate the specific report. However, the brief information on the index card provided sufficient evidence that the lead was checked out in 1957 and found to be of no value in the case. March 2001: Because a considerable amount of time has passed since our last case update, several visitors have written to us in recent weeks and asked if the Boy in the Box investigation has been temporarily suspended or perhaps even abandoned. To those of you who may be thinking more or less along those same lines, we'd like to say that nothing could be further from the truth. Rest assured that the Boy in the Box investigation is being aggressively pursued by both the Philadelphia police department and the Vidocq Society. Please understand, however, that the investigators are currently dealing with some extremely sensitive and confidential matters, the details of which can't even be shared with most other law enforcement personnel, let alone the general public. These strict security policies are absolutely essential to ensure that the Boy in the Box investigation is not compromised in any way. This case is far too important to risk having it all "go up in smoke" due to a premature or otherwise imprudent disclosure of vital information. Surely, it is far better to err on the side of caution. Therefore, we ask everyone to please be patient and bear with us. When the investigators have concluded their current work, they will decide what specific information, if any, can safely be communicated to the public via this web site. April 2001: The investigators revealed an important breakthrough in the case: Last fall, an independent laboratory finally obtained a mitochondrial DNA profile from the unknown boy's teeth. (Previous attempts to obtain a valid DNA profile had failed due to the badly deteriorated condition of the boy's remains.) The investigators plan to compare the boy's DNA profile against tissue samples they hope to obtain from individuals who either claim to be, or who are suspected of being related to the unknown boy. Such tests should confirm or, alternatively, rule-out any alleged relationship. Additional details about this dramatic new development were not revealed. Of course, we will be following this story closely, and will promptly report any new information that is disclosed to us. June 2001: The investigators announced that they recently decided to discontinue their active pursuit of a lead that had initially appeared to be quite promising. Unfortunately, after devoting an enormous amount of time and resources to this effort, they ultimately concluded that the lead was just another "dead end." On September 8, 2000 a woman entered the Lincoln Park, Michigan police department and said that she had information to offer relative to the Boy in the Box homicide case. (Lincoln Park is a suburb of Detroit.) The woman stated that she first became aware of the case in February 1999 when it was presented on an episode of the Unsolved Mysteries television program. She said that she recognized the image of the unknown boy as being identical to that of a boy who was part of a family that moved into her Detroit neighborhood in the mid 1950's. After the television broadcast, the woman contacted the program's producers and was referred to several law enforcement agencies. However, she felt that her information had not been well received by those agencies. She said that she hoped the Lincoln Park police would pass the information along to the proper investigating agency. According to the Michigan informant, the boy who moved into her Detroit neighborhood was born in Tennessee in the early 1950's. While the boy's biological father was serving time in a Tennessee prison, his mother met and married a man from Knoxville. The informant stated that this man was a very rough character. She said that he was a drunkard who disliked the little boy intensely and mistreated him. She described the boy as a very shy, withdrawn child who could do nothing right in the eyes of his stepfather. The family later moved to Detroit, Michigan, (circa 1956), where the boy's stepfather obtained a job at the Ford Motor Company. Periodically, however, they would make return trips to Tennessee to visit with relatives. According to the informant, just prior to their departure on one of these trips, the boy tried to cut his own hair. Predictably, he made a real mess of it, cutting out several patches of his light brown hair. This infuriated his stepfather. When the family returned from Tennessee two weeks later, the boy wasn't with them. The informant said that she became concerned and inquired about the boy's whereabouts. Strangely, the boy's mother offered no explanation regarding her child's mysterious absence. However, the stepfather told the informant that they had made arrangements for the boy to be adopted by a Tennessee doctor. Although the informant disbelieved the man's story, she did not pursue the matter. Shortly after this unusual incident, the informant moved out of the area and had no further contact with the family from Tennessee. The preceding information was immediately transmitted to the Philadelphia police department. Detective Tom Augustine, together with William Kelly, and Joseph McGillen of the Vidocq Society, decided to contact officials at the Tennessee Department of Corrections to ascertain if the boy's biological father had actually been in jail in Tennessee during the early 1950s. While this was being done, the investigators also tried to locate living family members, including two women who were alleged to be half-sisters of the boy by virtue of their mother having married three separate times. According to the Michigan informant, one of the half-sisters was named Vicky. The two half-sisters were eventually located with the assistance of another police department, but it was only after they were found and interviewed that the investigators learned that the boy's original surname was other than that which the Michigan informant had initially supplied. Once that was determined to be so, it rendered all of the prior investigative work useless. Much of that work included a fruitless search of law enforcement and genealogical records based on the wrong surname. Vicky confirmed that she had always been told that her half-brother had been adopted by folks in Tennessee, but she knew no more than that. Upon checking with at least one other extended family member, it was revealed that this person had been told by another (all identities withheld) that at some time in the 1960's, the boy, having grown into his late teens, had successfully sought out and met his biological father. At that time, he was wearing a U.S. Air Force uniform. However, the woman to whom this story was attributed died years ago, and all efforts to confirm this information through other parties met with no success. Not only did the boy from Tennessee bear no physical resemblance to the Boy in the Box; there was no way to ascertain what had become of him or even determine his subsequent surname. Neither his two half-sisters, nor any other living relative, has seen him or knows what happened to him after he was allegedly "adopted" by an unidentified "doctor" in the late 1950's. There are, in fact, no records substantiating that a legal adoption ever took place. Chances are that the alleged "adoption", if it happened at all, took place outside the usual legal parameters for such things. It is known that there were illegal "adoption mills" flourishing in Tennessee during that period of time. As for checking military records, this path just wasn't open to the investigators because, if the boy did enlist in the armed forces, he did not do so under his original surname. Ultimately, the investigators decided to discontinue active pursuit of the Michigan lead because, in their collective judgment, the investigation had reached a dead end. June 2002: Philadelphia Homicide Detective, Tom Augustine, accompanied by Vidocq Society investigators, Joseph McGillen and William Kelly, drove to Cincinnati, Ohio and interviewed a woman who claims to know the unknown boy's name and the events surrounding his death. During a three-hour interview, the woman told the investigators that the boy's name was "Jonathan", and that she had lived with him in Lower Merion, PA, a well-to-do suburb of Philadelphia. She said that the boy was fatally injured when he was thrown to the bathroom floor by her abusive mother after he threw up in the bathtub. Allegedly, the boy was mentally handicapped and had been subjected to systematic physical and sexual abuse, being forced to live in the cellar where he slept in an empty refrigerator box. About two years prior to his death, the unknown boy had been sold by his natural parents to the woman's mother. None of this information has yet been verified or corroborated by others. The Philadelphia police department and the Montgomery County District Attorney's office are now conducting an intensive follow-up investigation in order to confirm her testimony. This story has been picked up by the press and TV news media. News articles about the case will be promptly posted in the America's Unknown Child website archives. February 2003: The investigators reported that they have successfully tracked down and interviewed several people who used to live in the Lower Merion neighborhood where the unknown boy allegedly resided. Thus far, none of these potential witnesses have been able to confirm that a child matching the unknown boy's description lived there at that time. The search for additional former neighborhood residents continues. Also, the current residents of the house where the boy allegedly lived have refused to allow investigators to search their basement for trace evidence that might link the boy to that location. On another front, the unsolved 1955 Steven Damman kidnapping case is being re-examined to see if any crucial evidence might have been overlooked or discounted by the original investigators. If possible, an attempt may be made to establish a DNA link between the unknown boy and Steven Damman’s living relatives. October 2003: After a long delay, the investigators were finally granted permission to examine the basement of the Lower Merion home where the unknown boy allegedly resided. Unfortunately, no trace evidence of the boy was found. Analysis of a DNA sample submitted by Steven Damman's sister proved conclusively that Steven was not the unknown boy discovered in Philadelphia in 1957. Vidocq Society investigators are continuing to track down several additional clues they have derived from analyzing the testimony of the Ohio informant. One of those clues involves the remote possibility that the Ohio woman and the unknown boy may actually have been cousins. The Ohio woman has told investigators she suspects that her uncle may have been the boy's biological father, although she admits that her suspicion isn't based on any hard evidence. It is merely a "gut feeling" based upon her personal observation of the special attention and affection shown towards the boy by her uncle whenever he visited their home. Since the hypothetical genetic relationship isn't through the boy's maternal line, his mitochondrial DNA profile cannot be used to confirm or deny this possibility. In their search for an answer, the investigators must employ traditional investigative techniques. March 2004: Detective Tom Augustine was contacted by people in Florida who claimed that their mother was the unknown boy's birth parent. They submitted DNA samples for testing at their own expense. The DNA samples were analyzed, but they didn't match. When Detective Augustine informed them of this, the people in Florida insisted that the DNA lab must have made a mistake because they were absolutely certain that their mother was the boy's birth parent! Subsequently, they submitted a sample of their mother's DNA for analysis, again at their own expense. The mother's DNA sample also failed to match the unknown boy's DNA profile. The investigators also received a tip via the Internet about a large family of poor tenant farmers who lived in Bustleton, not far from the Fox Chase site where the unknown boy's body was discovered. They allegedly moved away quite suddenly in early 1957. The youngest child in the family was said to be about the same age as the Boy in the Box. Preliminary investigation indicated that the family had, in fact, moved to Virginia suddenly in 1957, but none of the children died during childhood. The eldest child was contacted and he agreed to submit a DNA sample for analysis. His DNA did not match the unknown boy’s DNA profile. May 2004: We sadly regret to announce that Sam Weinstein, VSM, the man who headed the Vidocq Society's Boy in the Box investigation from 1998 to 2000, passed away quietly in his sleep on May 16th. He had been ill for several years. Sam was the second policeman to arrive at the scene when the unknown boy's body was found. Weinstein later became a detective and participated in the investigation of the Boy in the Box case. He retired after serving 35 years on the police force and became a member of the Vidocq Society. In 1998, Weinstein was appointed to head the society's Boy in the Box investigation. He was later joined by two other retired crime fighters: Joseph McGillen, formerly an investigator with the Philadelphia Medical Examiner's office, and William H. Kelly, former Supervisor of the police department's Identification Unit. In February 2000, Sam Weinstein was compelled to discontinue active involvement in the case due to medical reasons. September 2004: During the past year, Vidocq Society investigators located and interviewed additional people who used to live in the Lower Merion neighborhorhood where, according to the unsubstantiated testimony of an Ohio woman, the unknown boy was secretly confined in a basement and subjected to physical and sexual abuse for two years prior to his death. Two of the former neighbors had been frequent visitors to the home, and they had access to all areas, including the basement. They flatly denied that a young boy lived there. A female neighbor who had been a close friend of the family and attended the same church, said that she was astonished to learn of the false accusations being made against them. She stated that the Ohio woman's allegations are "preposterous." The Vidocq Society investigators believe they have now exhausted all investigative options relative to the Ohio lead. Sadly, what had initially appeared to be the most significant breakthrough in the long history of this investigation, has ultimately turned out to be just another frustrating dead end. November 2005: Although infrequent "tips" and potential "leads" are still received by the investigators, none of them have proven to be of any value in helping to solve the case. No further progress has been made during the past year. However, the investigators have begun a new initiative. They are trying to determine if the DNA profile of America's Unknown Child matches any of the DNA profiles in a national mitochondrial DNA database.